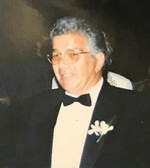 Joseph Martucci Obituary - Brooklyn, New York | Scarpaci Funeral Home Inc.
Joseph R. Martucci, 82, born in Brooklyn, New York and longtime resident of Staten Island, passed away peacefully at home on February 2, 2019, surrounded by his loving family. Joe attended Saint Simon and Jude grammar school and Lincoln High School. In 1954 he enlisted in the United States Airforce and served his country during the Korean War. In 1956 he married his high school sweetheart Mildred Longarelli. Returning home from service he worked in the construction industry as a heavy equipment operator. Always ambitious and forward looking he borrowed enough money to buy his first piece of equipment. Through hard work and sacrifice he built up a successful and respected construction company, Joseph R. Martucci, Inc. He enjoyed spending time with his family, gardening, traveling, and relishing life. Joseph is survived by his wife, Millie, and their five children, Donna (Gary), Joseph (Diane), Richard (Dawn), Joanne (Tony) and Christopher; as well as ten beloved grandchildren, Vanessa, Megan, Ashley, Joe, Nick, Alex, Joe, Jade, Sam and Danielle. He is also survived by his brothers Peter and Charles and was preceded in death by his brother, Theodore. Joseph favorite quote was “it is better to have lived one day as a lion then a hundred years as a lamb”. That is how he lived his life. He will be remembered, as a loving husband, father and grandfather and will be missed dearly. A celebration of Joseph’s life will include calling hours at Scarpaci Funeral Home in Brooklyn, on Tuesday 2/5, from 4 - 8 p.m. The mass will be held at St. Simon and Jude Roman Catholic Church in Brooklyn at 10:45 a.m., on Wednesday 2/6.